From 1990 to 1994, the Austrian Archives for Adult Education's journal was originally entitled “Association for the History of Adult Education Centres – Notes or Bulletins”. In 1995 the journal was renamed “Spurensuche. Journal on the History of Adult Education and Popularisation of Science”. 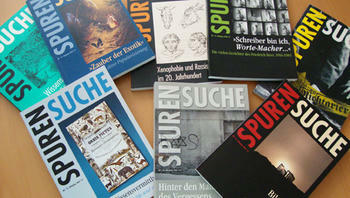 SPURENSUCHE is, firstly, the search for the Concealed or the Forgotten, the search for past philosophical and historical ideas as well as manifestations and developments of institutions and individuals that have up to now received too little consideration in “great” academic university-based historiography. In terms of an “Archaeology of Knowledge”, – based loosely on Walter Benjamin, Carlo Ginzburg and Michel Foucault – it is important that these neglected segments of the past are developed and processed against the predominant mainstream of historical-scientific research by using historical sources and that they are also made accessible to the public in a manner that is visually appealing. SPURENSUCHE in its broadest sense means to turn axioms and hierarchies regarding the history of education and science upside down. The history of adult education and ethnology neither coincides with the history of education nor with the history of pedagogy, and it is also not to be conceived as simply the history of science, which deals with the historiography of established academic subjects in the “Temple(s) of Sciences” (Karl Liebknecht). Instead, historic research into the history of adult education and ethnology deals with the far less obvious, but still historically powerful traces of alternative knowledge transfer and social knowledge diffusion, their basic concepts and ideals, the organisational forms and educational paths of communication necessary for them to succeed as well as the persons involved, whether they be teachers or students. Educational exclusion processes, which are relevant from both a personal-historic and socio-historic point of view, and endeavours to incorporate educational policy are provided with a platform for presentation and analysis in a place where science and the public, knowledge and power, advanced and folk cultures as well as mass and elite cultures meet. SPURENSUCHE in its narrowest sense is the material securing of evidence with regard to the diverse and complex tradition of adult education centres as the most historically significant establishments for adult education in Austria. Particular focus has been placed on its history of ideas and concepts, which span more than 150 years, its organisations, predecessor institutions and related institutions abroad as well as the people involved and the designated target groups.